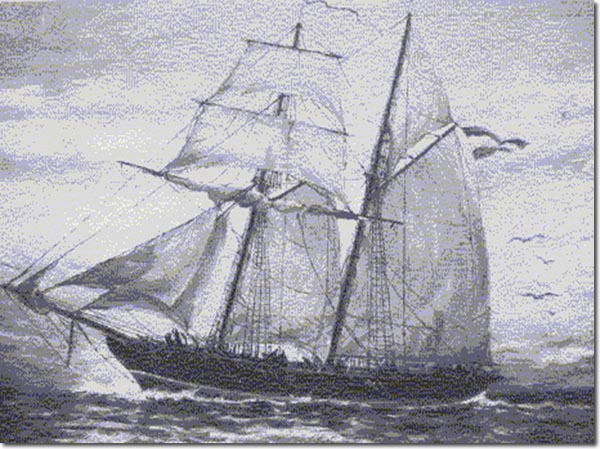 This is an artist's representation of the Argentine ship Sarandi that came to the Falklands in 1832 in order to help set up the penal colony, but then returned to Puerto Soledad to help it when a mutiny broke out. It was under the command of Lieutenant Colonel Jose Maria Pinedo. Whilst in the islands, two British ships arrived and informed Pinedo that the British were reestablishing their claims to the island and requested that he leave and take any inhabitants who wished to travel with him. The Sarandi was outmatched in firepower and withdrew back to Buenos Aires.